Tamsin: Here is a problem from the Segoe Tesuji Dictionary. The solution is easy to see (it's a C stream problem), but I am not convinced it works! Velobici: What's an Oki? large? big? great? How does this relate to the group of problems? Andrew Grant: An oki is a placement tesuji, in other words a move played not in contact with an enemy stone. in the solution diagram below is the oki tesuji. Obviously this is a great outcome for Black. But what if White responds to in a different way? And it is three liberties versus four. The only thing I can think of is that Black can sacrifice 1 in order to get something on the right, but I don't find this very convincing. It is a local tesuji problem, after all, and not a whole-board problem. I must be missing something, but what? Thanks in advance for removing the scales from my eyes! HolIgor: Taking into account the fact tha after the sacrifice white has yet to spend a move to build eyes, black is very happy. Tamsin: Point taken, but, the results in the dictionary are generally rather more clear-cut than that. 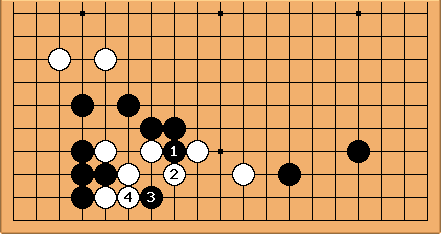 If White follows orders like this Black gets points, thickness, turns the marked white stones into wasted moves... Paradise! John F. Plus White is not yet alive, so Black gets sente. Tamsin: I did see this variation and thought it was very good, but was not sure because it was not a clear cut local knock-out, as in the main line. Bill: Why do you say that, Tamsin? Tamsin: Black captures 1 stone. Yes, White must run out, but I would not call that a knockout. Andrew Grant: While I'd be quite happy with the above variation, it may be that Segoe simply didn't spot this way of playing. Problem collections are not infallible. When I looked this problem up in my old (1975) copy I found it was problem 82 in the Oki section, not 81 as Tamsin states here. It would appear one of the other problems in this section has been removed in the new edition, presumably because it has been found to be faulty. PatrickB: Having worked through a number of the geta problems, I'm sure that Segoe did in fact see this sacrifice. 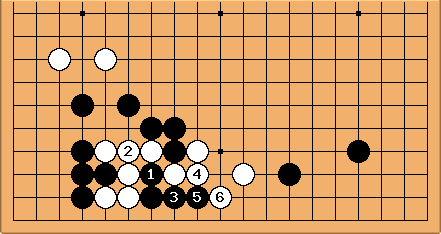 There are many problems in the book where black sacrifices some stones where he could in fact capture to get huge outer thickness and capture other stones, or where the tesuji leads to a single black group between two weak white groups with poor shape, even in the geta problems where we would typically assume the goal is to capture stones! See geta problems #3, #5, #6, and #53, for example. Remember, these are half-board "get a good result" problems! John F. I'm interested why Tamsin is a bit fuzzy about this and can't see it as a knockout blow. I'm sure any pro or strong amateur would resign if this happened against him. Here is how I think about it. There are two parts - the process and the evaluation. As to the process I, and I'm sure DJ too, see this sort of sacrifice solution instantly and as a continuous flow - the whole thing is one suji, a one-way street. 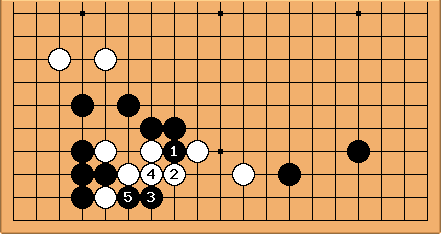 For the evaluation, at kyu level it may just be sufficient to say the above (points, thickness, wasted moves, sente) but at dan level it usually goes a bit deeper. It''s hard to capture thoughts on paper, but I'd start by imagining a White play here, to assess whether it was worth Black playing here. I'd see something like a White connection on the second line, giving White a stable group and 10+ points of likely territory, plus he still has a route to the centre. Because this White group is stable, invasion of the black group on the right becomes possible, and the black group on the left is not looking too good. It can't be killed but it can be severely ijime-ed. So it's urgent for Black to do something here if he can. The oki (placement) seems fairly obvious. The main result in the book gives best play for both sides, obviously. Black's left group can no longer be ijime-ed while White is small and not secure enough to do much on the right. The above unshown sacrifice is SO much better. White gets only three points + 2 captures, and is shut out of the centre, Black's two groups are connected and can no longer be ijime-ed. He has atsusa thickness, which is much better than atsumi thickness. All four of White's outside stones are incredibly weakened. 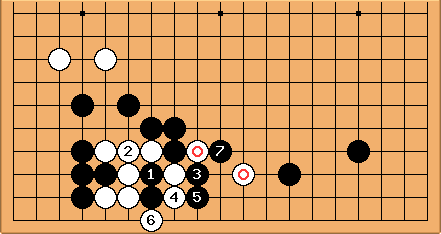 And if we assume that Black uses his sente to eliminate the aji of the two triangled stones, and then compare the position to the one where White plays first, I'd estinate that Black is three stones better off. Over to you Tamsin: what's your thinking? Starting with 1 is dubious. 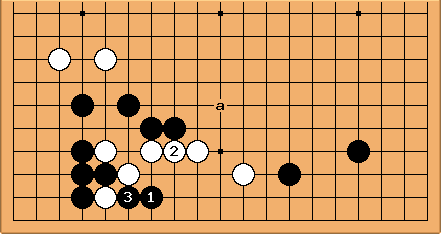 Hans:After the sequence above black 1 seems to be a bad move. I would prefer starting with the placement at 3. In this case exchanging black a for white b would not be good. Bill: But why should White make bad shape with ? It's not like Wc is such a great follow-up. Isn't the bo-tsugi at better, leaving White more solid? Next, maybe White will run out with Wa, which she cannot do if Black starts with .